POSTED February 28, 2018 2:51 p.m.
PLATTEVILLE — For the second consecutive season, three teams will represent the Wisconsin Intercollegiate Athletic Conference (WIAC) in the NCAA Division III Men’s Basketball Championship after regular season champion UW–Platteville, UW–Stevens Point and UW–Oshkosh earned bids into this year’s field. UW–Stevens Point (19–8) received an automatic bid into the 64-team event after winning the WIAC Championship (presented by Culver’s) with a 59–44 victory over UW–River Falls on Sunday afternoon. 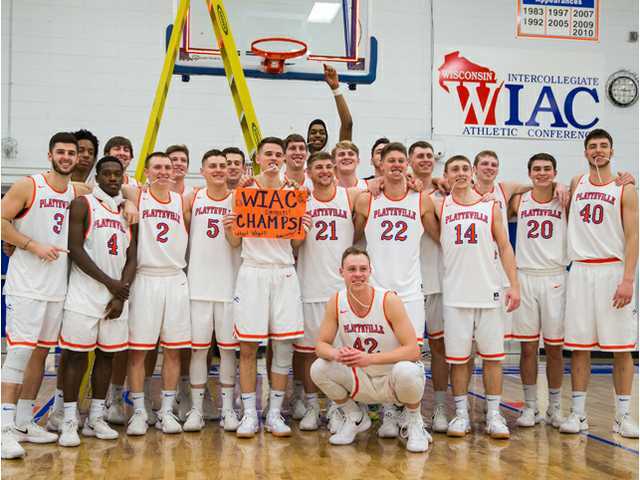 Regular season WIAC champion UW–Platteville (22–4) and third-place UW–Oshkosh (20–7) claimed two of the 21 at-large berths into the tournament. Coach Jeff Gard’s Pioneers, who are making the 11th NCAA appearance in program archives and first since 2009, won national titles in 1991, 1995, 1998 and 1999. With a 31-6 all-time national playoff record, UW–Platteville has the best winning percentage (83.8 percent) in NCAA III playoff history. UW–Platteville will host Monmouth College (Ill.) (20–7) in a first round contest Friday night at 7:30 p.m. at Williams Fieldhouse. The winner will advance to play the winner of Firday’s 5:30 p.m. first round matchup between St. Olaf College (Minn.) (19–7) or Sul Ross State University (Texas) (22–6) in the second round at 7 p.m. Saturday, also at Williams Fieldhouse. Junior Robert Duax, who scored a team-high 22 points and surpassed the 1,000-point mark for his career in UW–Platteville’s 71–66 WIAA tournament semifinal loss to UW–River Falls last Friday night, leads coach Jeff Gard’s Pioneers at 15.3 points per game. The 6-foot-4 guard from Dubuque is shooting 51.2 percent from the floor, 40.0 percent from 3-point land, and a team-best 81.5 percent at the free throw line, and averages 4.3 rebounds and 2.2 assists per game. Senior point guard Matt Oestreich is averaging 10.9 points and a team-high 2.5 assists per game. Sophomore Carter Voelker averages 10.3 points and 3.7 rebounds, while freshman sensation Quentin Shields averaged 10.5 points and 3.1 boards per game off the bench. Senior forward Jake Showalter (6.5 ppg, 2.3 rpg) and junior center Clay Gerds (7.4 ppg, 5.6 rpg, 1.1 bpg) round out the Pioneers’ starting lineup. Monmouth earned its spot in the big dance with a 79–76 victory over Ripon in the Midwest Conference tournament championship game and earned its first NCAA tournament berth since 1990. The Fighting Scots are averaging 77.1 points per game, while allowing 70.6. Senior Justin Aluya (15.7 ppg, 9.1 rpg) and senior Will Jones (14.7 ppg, 3.5 apg) all averaged double figures for Monmouth. The Pointers will square off against North Central College (Ill.) (19–8) in their opening game in Collegeville, Minn., with the winner facing Saint John’s University (Minn.) (23–3) or Bethany Lutheran College (Minn.) (19–8) on Saturday. UWSP is making the 15th NCAA appearance in program history and has won national championships in 2004, 2005, 2010 and 2015. The Titans will face Marietta College (Ohio) (21–6) in their first round game in Springfield, Ohio. The winner will play Misericordia University (Pa.) (17–10) or Wittenberg University (Ohio) (26–2) in the second round. UW–Oshkosh is making its third straight postseason showing and eighth overall.